The voice of morning radio in Blackpool, Hayley Kay has announced her plans to leave Radio Wave this summer. And after once taking up residence in Blackpool Tower as part of a week-long fund-raising campaign, the Marton mum-of-one will start a new career promoting the attraction to hoteliers. She’s been hosting the breakfast show for 10 years, and will start her new role as the new accommodation liaison officer for Merlin Entertainments’ Blackpool Cluster - including the Tower, the Tower Dungeon, SEA LIFE Blackpool and Madame Tussauds Blackpool - next month. Speaking to the Gazette, Hayley said: “Radio Wave has been a huge part of my life, I’ve been there since I was 21. “And in the time I’ve hosted the breakfast show, I’ve moved house twice, met John my fiance, had our son Freddie; it has been a big chunk of my life. “I turned 40 recently, and it’s not quite the same being a girl about town now as it was in my 20s. In addition to her work as a presenter, Hayley has a newspaper column in the Blackpool Gazette and sister paper the Lancashire Evening Post. 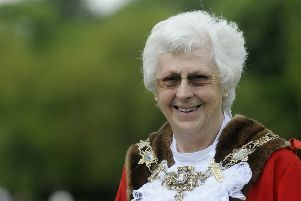 She is also an active ambassador for Blackpool Young Carers, as well as supporting a range of local causes, raising thousands of pounds over the years. She's also been a regular face in the Grand Theatre's annual pantomimes, and host of awards events across the North West. Hayley’s new role was unveiled at a coffee morning at the Tower Ballroom yesterday, at a coffee morning attended by more than 300 resort hoteliers. Hayley said: “It is a great honour to be working at such an iconic location. During her time as the breakfast show host, Hayley worked initially alongside Roy Lynch, then Ged Mills - who left last year, and currently with Scott Gallagher. “The person I spoke most to about maybe leaving Wave was Ged, he’s been my inspiration since he left last year; it has been great to watch him progress," she said. “The great thing about Radio Wave is they have been really supportive, and they want me to still be part of the Wave family. Radio Wave's content controller Chris Bovaird said: "We wish Hayley all the best for future after a very successful 10 years on the Radio Wave breakfast show, we are excited to announce that Hayley will be staying on the Radio Wave team and we’ll be able to reveal more details on that very soon. "In the next few weeks we will be unveiling our brand new co-presenter who will be joining Scott Gallagher on the new look Radio Wave breakfast show, these are exciting times for Radio Wave and we look forward to sharing our good news with our listeners very soon." Head of the Merlin cluster in Blackpool, Kate Shane said: “We are delighted to have Hayley joining the team.